BMW India announced the launch of 'BMW Secure Assistance' - the best-in-class premium road side assistance across India. in the aftersales customer service. The BMW Secure Assistance will allow BMW dealerships to provide professional roadside assistance to customers and enable them to continue their journey. "BMW has the most desirable product portfolio in India that delivers 'Sheer Driving Pleasure'. Premium Brands require Premium Service. By supporting our product portfolio with best in class after-sales initiative like BMW Secure Assistance, we are setting new benchmarks in customer orientation and aftersales support. A fleet of a specially equipped BMW X3 across our dealer network is a best in class practice amongst premium brands and is focused to exceed the customer expectations and create customer delight," said Philipp von Sahr, President, BMW Group India. Representing more than 25 years of BMW Group experience in roadside assistance, BMW Group's technical team has created an optimal configuration to meet highest BMW standards in functionality, usability and design across the Customer Service Vehicle (CSV) fleet. The specially-equipped fleet includes a professional equipment to enable the Secure Assistance technician to provide help. The completely kitted car will include special tools, tyres, and batteries for jump start facility. To avoid dangerous situations while working next to moving traffic, the Customer Service Vehicle (CSV) will be equipped with visibility enhancing features. Reflective warning decals around the car make it instantly recognisable as a BMW Secure Assistance vehicle. The Customer Service Vehicle (CSV) has also been designed to assist in providing transport for up to 3 (three) people should they be required to leave the breakdown site. BMW India has provided a special training program for the Dealer staff on the technical, functional and operational usage of these Customer Service Vehicles to make this initiative most effective for customers in the time of need. The training includes best-in-class practices as well as safety measures related to roadside assistance. 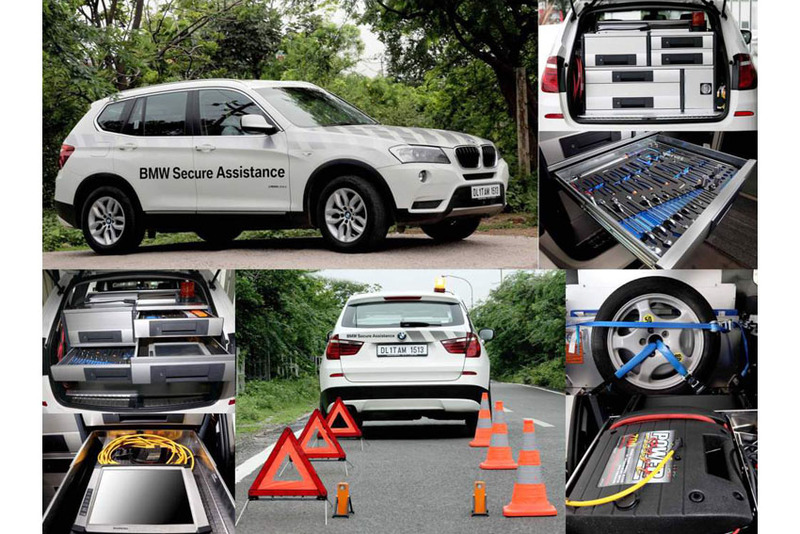 BMW India is currently working with Allianz Global Assistance (AGA) to ensure customers are provided best possible assistance in the event of a breakdown. Under Secure Assistance, AGA will continue to coordinate and monitor the breakdown situation between the customer, dealer and other relevant parties and decide the best mode of assistance ranging from Customer Service Vehicle (CSV) to flat bed vehicle.